Digital textbooks. The government has put forth the goal of creating a “one person, one device” learning environment by the year 2020, and MIC and MEXT are cooperating on administering a pilot program in 20 elementary schools. Even so, Korea has done much better. Plans surrounding the implementation of digital textbooks are five years ahead of Japanese efforts, and the learning environment is built around the assumption that its students are digital natives. The background to all of this goes back to 1997, when Korea, treading close to a dangerous run in with the IMF, developed the will, in both public and private sectors, to find their way forward through education and technology. They have certainly made good on concentrating resources in these two areas. Korea is ranked first among OECD countries in technological literacy (Japan is ranked fourth). Utilization of technology dominates teacher evaluations, and they are passionate about developing educational materials. 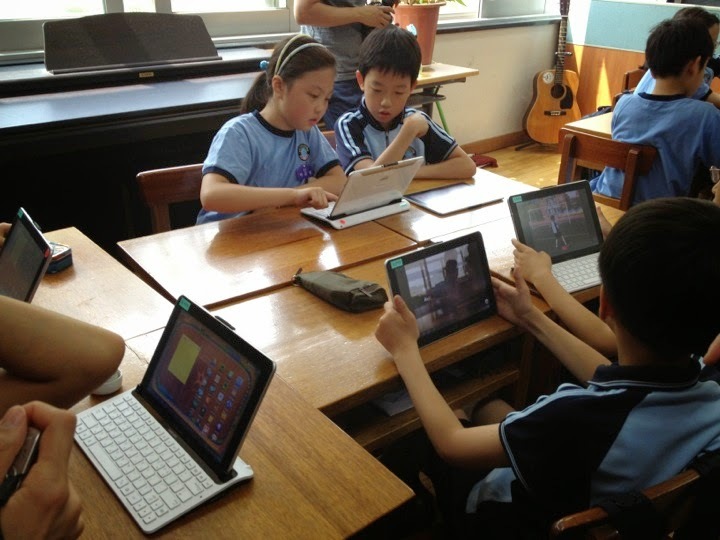 If you walk the grounds of a Korean school, you will be met by the sight of teachers and students using tablets and smartphones to the full range of their capabilities, integrating them in the classroom without instruction or training, and all of it a common, everyday occurrence. Currently they are migrating from a system based on use of PCs, to a mobile system that is based on tablets. Rather than just noting their progress, we need to pay some attention to the ways in which the Korean approach differs from the Japanese approach. The Korean approach privileges content. Digital textbooks, which is to say, apps and content are arranged in the cloud such that they can be accessed without regard to which device is being used. It is a very different image than the “one person, one device,” hardware-focused plan being embraced by Japan. They plan to make all apps and content accessible by any device by the year 2015. As cloud-based content races ahead, a plan which is designed to work with any device is far outpacing Japan, still weighing the pros and cons of introducing PCs into the classroom. Even more surprising is the fact that Social Networking Services (SNS) are being introduced in to the school environment. At the public school I visited, students used Korea’s official school SNS, “CLASSTING,” to post pictures, and share summaries and their thoughts on classes using Evernote and Google Docs. Teachers communicate with students and their households over not only CLASSTING, but using Facebook and twitter as well. In addition to students being able to access practice and review at home using the computer, their parents are able to check the contents of lessons in real time. The example of Korea, with its two features, a system built around the axis of social media services, and open connection with student’s households, parents, and guardians, it’s probably safe to say, is the newest release. The future is here.